Kareena Kapoor Khan, Alia Bhatt, Shahid Kapoor, Diljit Dosanjh starring film Udta Punjab’s official trailer was released. The film based on the Punjab narrates the story of youth addicted to drugs. 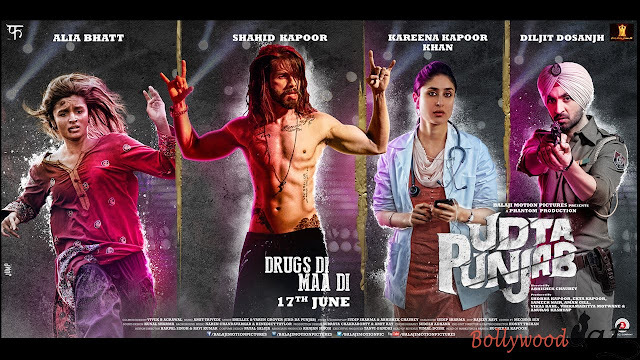 Shahid Kapoor will be seen as rock star Tommy Singh while Alia Bhatt will be seen as a migrant worker. Kareena Kapoor Khan will be seen wearing doctor’s coat and stethoscope while Diljit Dosanjh puts on the uniform of a cop. The promoters Balaji Motion Pictures released the official trailer posing a question over the link that connects these four falling in four different categories. And that connection is Udta Punjab. The 3.09 minutes long trailer shows a lot of links leading to the use of drug. The trailer begins with the quote that over 70 percent of youth in Punjab use drugs and if this continues Punjab will become like Mexico. Earlier the film was criticized over the use of vulgar words and slangs in abundance, there are not a few in the trailer as well. Even Alia utters a few to perfect her character as a migrant labourer. Abhishek Chaubey directs the movie which will be co-produced by Shobha Kapoor, Ekta Kapoor, Sameer Nair, Aman Gill, Vikas Bahl, Vikramaditya Motwane and Anurag Kashyap. Balaji Motion Pictures does distribution and promotion. The film is scheduled to be released on June 17.